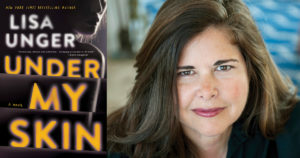 Enter your address below for your chance to win an exclusive early advanced reading copy of Under My Skin by Lisa Unger. What if the nightmares are actually memories? It’s been a year since Poppy’s husband, Jack, was brutally murdered during his morning run through Manhattan’s Riverside Park. In the immediate aftermath, Poppy spiraled into an oblivion of grief, disappearing for several days only to turn up ragged and confused wearing a tight red dress she didn’t recognize. What happened to Poppy during those lost days? And more importantly, what happened to Jack? The case was never solved, and Poppy has finally begun to move on. But those lost days have never stopped haunting her. Poppy starts having nightmares and blackouts—there are periods of time she can’t remember, and she’s unable to tell the difference between what is real and what she’s imagining. When she begins to sense that someone is following her, Poppy is plunged into a game of cat and mouse, determined to unravel the mystery around her husband’s death. But can she handle the truth about what really happened? We’re giving away five copies this week, courtesy of Park Row Books. *Crimereads is collecting consent to send promotion emails on behalf of BookClubbish, a division of Harlequin Enterprises Limited (Harlequin.com) which is located at Bay Adelaide Centre, East Tower, 22 Adelaide Street West, 41st Floor, Toronto, Ontario, M5H 4E3 (1-888-432-4879). Harlequin Enterprises Limited sends informational and promotional emails on behalf of itself and Harlequin Digital Sales Corporation. Subscribers can unsubscribe at any time.